Kansas is home to one of the longest winning streaks in the country: No Republican has lost a Senate election there since 1932, when Ben Paulen lost by just under four points to George McGill. What’s more, if there was ever a year where a Republican would lose, 2014 would be an unlikely candidate. Sen. Pat Roberts clearly finds himself in the fight of his political life. With just under four weeks to go until Election Day, he trails his opponent, Greg Orman, by 2.4 percentage points in the RCP Average -- though a new CNN poll finds him leading by a point and a Fox News survey has him ahead by five. Still, that is not a good place for an incumbent to find himself. How did this happen, especially given the national environment? It is actually a confluence of several factors. The national environment aside, if a Republican were to lose a Senate race in Kansas, it would be exactly under these circumstances. There are four factors working against Roberts here. First, we should keep in mind that the GOP’s winning streak, real as it is, is dependent upon some luck. To wit, Arthur Capper defeated Omar Ketchum by three points in 1936, Frank Carlson defeated Charles Dawson by nine points in 1951, James Pearson defeated Floyd Breeding by seven points in 1966, and Bob Dole famously won by just 1.5 points in 1974 (Sam Brownback also had a reasonably close race in 1996). Sooner or later, that luck is bound to run out. Second, the state is not completely averse to electing Democrats. In fact, it does so regularly for the governorship -- since 1966, Republicans have only won in 1974, 1986, 1994, 1998 and 2010. That is one two-term Republican governor in the past 48 years. The Democrats’ base coalition is straightforward: Wyandotte County (Kansas City), Atchison County, and Douglas County (Lawrence, home of the University of Kansas). Those are the counties that Jim Slattery won against Roberts in 2008, when he lost by 20 points. Add to those Ellis County (Fort Hays State University) and some of the counties around Wichita, and you get Jill Docking’s coalition against Sam Brownback in 1996 -- a 10-point loss. To win, however, a Democrat must benefit from the third factor: The term “Republican Party of Kansas” is something of a misnomer. In fact, Kansas is something of a three-party state, with the GOP split between a moderate/liberal faction and a conservative faction. Like most Plains states, Kansas did not have much of a Democratic Party ancestrally. In fact, given its birth as an anti-slavery state, it is unsurprising that it gave strong majorities to Republican presidential candidates in the mid- to late-1800s, even as Republicans were winning presidential contests only narrowly. But Kansas’ anti-slavery status gave it a strong progressive impulse, which survived into the 20th century; William Allen White printed his nationally circulated Emporia Gazette in Lyon County. At the same time, the strength of farmers in the western reaches of the state made it susceptible to populist movements; James Weaver won there in 1892. Against this backdrop, it is unsurprising that the Democrats to carry the state were William Jennings Bryan, Woodrow Wilson, Franklin Roosevelt and Lyndon Johnson. Even the state’s national politicians have been surprisingly moderate: Gov. Alf Landon received the Republican nomination in 1936 in part because he was from the progressive wing of the party, and many people thought he could bring the West back into the Republican fold (he also received the nomination because most other Republican officeholders had been defeated in 1930, 1932 or 1934). Bob Dole’s first co-senator was James Pearson, who was nearly primaried from the right in 1972 after he voted against the ABM and the Clement Haynsworth Supreme Court nomination. Nancy Landon Kassebaum, Pearson’s successor, was a notable Republican moderate. When Democrats win, they are able to exploit this division among Republicans. This helped Dennis Moore win a suburban Kansas City district (based in Johnson County) after Vince Snowbarger proved too conservative for Republicans. Moore won several re-election battles, in part because the moderate and conservative Republican candidates would typically injure each other in the primaries, leaving open wounds with little time to heal before the general election. In 2002, Kathleen Sebelius was able to take advantage of this split to win the governorship. Roberts has actually positioned himself well for straddling this divide as a general matter, but this year finds himself in an almost insuperable position. He managed to win a Republican primary against Tea Party challenger Milton Wolf, but at the cost of alienating some of the conservative base of the party. At the same time, Gov. Sam Brownback had orchestrated something of a purge of party moderates during his term, and has governed as a staunch conservative, pushing many moderates away from the party in general. So Roberts has conservatives who are mad at him, and moderates who are mad at the party. It is a potent brew. Fourth, Orman is, broadly speaking, as well positioned for this race as he could be. He maintained a low profile throughout the Republican primary, and burst onto the scene just as Republican divisions had been laid bare in that election. Moreover, people are furious at Washington and at both parties right now. Orman seemed like a breath of fresh air at a time people really needed one. This is especially true against someone like Roberts, who has held elected office since the waning days of the Carter administration and who committed unforced errors such as not maintaining a residence in Kansas. Though Orman’s history as a Democrat, refusal to state which party he would caucus with, and lack of strong policy stances would probably catch up with him over the course of a lengthy campaign as the novelty wore off, the shortened campaign gives him a real opportunity to ride his initial momentum through to November. In other words, we wouldn’t expect a Republican to lose in Kansas in a year like this. But if one were to lose, it would be a candidate like Roberts, after a primary like the one Roberts had, when the state party was split as it is today, against a candidate like Orman. With that said, it is too soon to write off the incumbent. The polls have shown a more or less steady tightening. In order, they show Orman leads of 10 points, 10 points, six points, five points, five points, a tie, 10 points, five points and a Roberts lead of one point and five points. Further complicating things, pollsters don’t poll many competitive races in Kansas, and we don’t have recent exit polls to give us insight as to what the electorate should look like. That said, some of the demographic profiles we’ve seen in the surveys seem unrealistic. The recent Marist poll, for example, which showed Orman with a 10-point lead, showed a registered voter subsample of 81 percent white, 8 percent black, 6 percent Hispanic and 4 percent “other.” Yet the Current Population Survey found that 89.2 percent of registered Kansans were white in 2010, 3.8 percent were black, and 3.3 percent were Hispanic. In 2012, the numbers were 88.1 percent, 4.4 percent, and 3.7 percent. This should be taken with something of a grain of salt, and there’s some danger in mixing and matching your data sets, especially with different question wordings, but it does seem unlikely that one-in-five Kansas votes will be non-white. Regardless, Orman does have real problems as a candidate, which, over the course of a full campaign, would probably drag him down. In particular, refusing to declare which party you will caucus with eventually invites people to fill in the blanks in their own minds as they focus in on the race. Given that most things in Orman’s past point toward him at least sympathizing with Democrats, it seems unlikely that people would conclude that he is a Republican. But in a short campaign, anything can happen. 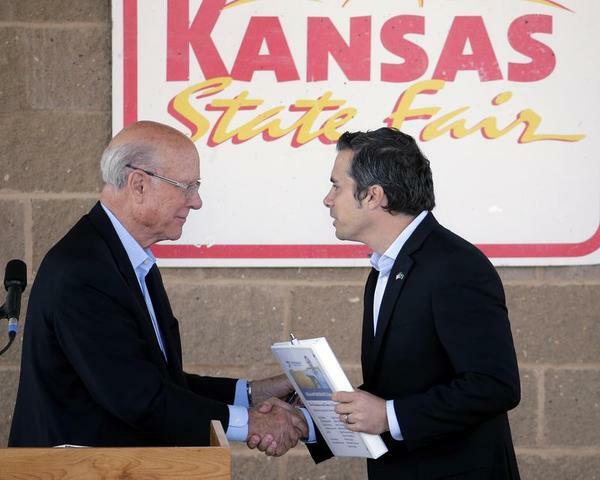 Roberts is a flawed candidate himself, and the rifts in the Kansas GOP over the past few years have not been smoothed over. We’ll have a better idea where things stand in a few weeks, but for now, Roberts is the most vulnerable Republican incumbent.